Whenever I have the time to spare, I will prefer to knead the dough by hand. This way, I will be able to get a feel of the texture, whether the dough is too wet or too dry. Some recipes will yield very wet and sticky doughs whiles others will give tougher, tenser ones. By having a feel of the texture while kneading, I will be able to co-relate it with the finished loaf, and hence, provide a better review of the recipe. I wonder whether it was the type of flour I had used, this dough was rather easy to knead as it hardly sticked to the work surface. For this loaf, I used Gold Medal's Better for Bread Flour, which is a stronger flour with a higher protein level. It is only slightly more expensive than the usual brand I use, but I believe it gives a better flavour to the bread, and I would think it is very suitable for making rustic, country-style type of bread. I like how the bread turned out...with a lovely crusty crust while the inside remain soft. The crumb has got a nice texture, not cottony soft and yet not overly dense or heavy. Stir bread flour, caster sugar, salt, and instant yeast in a mixing bowl. Add in milk mixture. Mix the ingredients with hand and slowly form into a dough. Transfer dough to a lightly floured work surface. Knead until the dough no longer sticks to your hand, becomes smooth and elastic. This should take about 20 mins. Do the window pane test: pinch a small piece of the dough, pull and stretch it. It should be elastic, and can be pulled away into a thin membrane without tearing/breaking apart. Wrap the butter in the dough and continue to knead until the butter fully incorporates into the dough. Place dough in a lightly greased (with vegetable oil) mixing bowl, cover with cling wrap and let proof in room temperature (around 28 to 30 degC) for about one hour, or until double in bulk. Remove the dough from the bowl and give a few light kneading to press out the gas in the dough. Smooth into round, cover with a damp cloth or cling wrap and let it rise for another 20mins. Divide dough into 2 equal portions, about 265g each. Roll into rounds. Cover with a damp cloth or cling wrap and let the doughs rest for 15 - 20mins. On a lightly floured work surface, flatten each dough into a round disc, roll the dough from the centre to the edges until the diameter is about 9". Flip the dough over. Fold the dough 1/3 from the left side towards the centre. Fold over 1/3 from the right side, to form a long rectangle (about 9" x 3"). Starting from the shorter end roll up swiss-roll style. Pinch and seal the seams. Place the two doughs, seam side down, in a well greased pullman tin. (See illustrations below). Dust the surface of the dough with some flour (optional). Cover with damp cloth or cling wrap and leave doughs to proof for the second time for about 40 ~ 50mins, or until double in size, or when the dough has almost reached the rim of the tin. Bake in pre-heated oven at 190 - 200 deg C for 30-35 mins or until golden brown. Remove from oven, unmold immediately and let cool completely before slicing. Under ingredients, you listed 10g of butter softened, but in your method, there is no mention of when butter is incorporated into the dough? Would you have missed it out? I like 欧式country-style面包, especially 法国面包, I will take home this recipe, thanks ya. Hi Anonymous, thanks for pointing out my mistake :') I have added in the part on the butter. So sorry for the error! Very nice bread! Looks very soft and country bread. Thanks for sharing! really enjoy viewing your bakes... always making me drool with awe. A belated happy birthday to you. Thanks for all your generous sharing. Hi Yan, I have added a sketch on the shaping method. Just double click on the sketch to zoom-in. Hope it helps. when my eyes glanced at the drawings a min ago... i thot to myself... is this in response to my 'dumb wit' query?? so sweet of u ...meltz...i am so very touched by your patience and kindness....... really!!!! Btw, you won't be available to join us for our bloggers' potluck party on 31 May? I really would like to meet you in personal! Hahaha... Thanks for taking the effort to draw out the steps for us! Happy (belated) Mother's Day! Nah, I am not up to standard to sell my bakes. Thanks for the invite, however, I am not able to go as my husband is away and my kids won't want to tag along! as the saying goes, 'a picture paints a thousand words'.. and you have achieved that very well indeed through your drawings which i believe will 'enlighten' many who are curious about this receipe and its making. Hi Thinkingmama, thanks for the link. Have you tried making the bread bowls? How did it go? 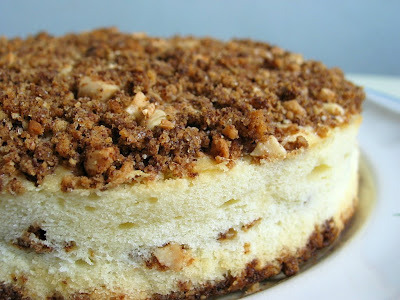 I am not sure whether I will be able to try this recipe as I don't have semolina. I have not tried baking crusty bread as I don't even have a spray to mist the dough ;p Guess I will only be able to try it after I get all the necessary items. Hi, I have tried it using bread flour and using the machine to knead for 20 + 10 mins as well as using the dough function and the dough was very very wet and its not successful. The only time the result seems a little successful was when I used plain flour and then the dough was not so wet. It manage to form a decent looking shape. I do not understand why the dough was so wet. Another blogger had used bread flour and her bread bowls look very nice as bread bowls should be. Therefore, I would like to trouble you when you are able, to try this recipe if possible. It sure looks like an super inviting breakfast bread european style with butter and jam or even clotted cream! YUM! Hi thinkingmama, could it due to the measurement of the ingredients? Too little flour, too much water? Did you measure the amount correctly? Did you use the correct measuring cup for measuring dry ingredients? 1 cup of King Arthur's bread flour is about 4.5oz (127.5g) and if u check it's website, 1/3 cup of water is 2 5/8 oz, base on my rough calculation, 1 cup of water in the recipe is around 7.9oz, around 230ml. Did u use this same measurement? I also think the type/brand of flour will also affect the outcome. i love it when you post in chinese, because then i can practice my reading skills! i'm actually looking for a sweet coconut asian type of bread/pastry that they sell in a lot of asian bakeries; would you happen to know of any recipes? Besides butter loaf, I also tried ur matcha red bean loaf. I made it in March but only manage to blog about it now. My first time making swiss roll style bread. I think it's not easy to roll it evenly to become a 'pillow' like urs. haha! You write beautifully in Chinese. I have been following your blog ever since I found your site 2 months ago. Nice pics and write-up. Well done! Keep up the good work. The first recipe I tried was hokkaido milk bread. It was fantastic. However, when I tried the sweet bun recipe and now you latest recipe, the dough somehow is very sticky. I used the machine to kneed for 30 mins and hand kneed it for more. However, it's still sticky, not like the texture for milk loaf. Because of that, I can't really make any nice shapes. The end result wasn't that bad though. Any tips you can give to make the dough not as sticky? Hi Squirrel, the sweet bun recipe is very wet and sticky, even after the 1st proof, the dough can still feel sticky. You can dust your work surface lightly with some flour, flour your hands as well and it will be easier to shape the dough. Are you referring to this English Bread recipe? For me, this dough was quite easy to knead, it is not sticky at all. I'm not sure what went wrong? How was the texture/taste of your finished bread? I used the bacon and cheese bread recipe. Is the dough meant to be sticky too? I will try the English Bread soon. The dough looks soooo tempting!! But if I were to compare cheese bread and english bread recipe, I would think that the texture of both should be similar since the ingredients and portions seem to be more or less the same. Hi Squirrel, the dough for the bacon & cheese bread is not as sticky as the sweet bun. I can't really compare the two doughs(this one with the bacon & cheese) as I used different flour and also, I knead this by hand while the other I used the bread machine. Thank you so much for your help and explanations. :) Again, very inspirational site you have. These are all light foods and there are so many people like these kind of foods. hi HHB, ever since i bought a breadmaker, I've been so fascinated by the breads and i love your blog.. i am very inspired by all your breadmaking.. thanks for sharing them..
this recipe looks very good... i've been making the sweeter type of bread so far and the kids love it.. but i think this one looks very good with Curry Chicken? Amazing how you do it. Your breads look as good as any French baker's! 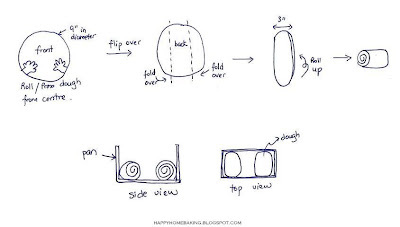 I would like to try my hands on your Swirl n Twirl bread but cannot figure out how to cut lengthwise n roll d dough.Hope yopu can help and could you kindly email me the pics of illustration on the rolling please.Thank you in advance. Hi Anonymous, I have sent it to you, hope you have received it. Hi, I tried this recipe, my very first bread :) The bread is awesome. Thanks for making the recipe so easy and comprehensive. The bread was not as soft as it was the following day. Is that to be expected with home-made bread or is it due to some other reasons? Hi Han Han, most homemade bread doesn't keep well as there is no addictives used. For this bread, it won't stay as soft due to the recipe (use less butter and no eggs). You can keep your bread in air tight container, and toast it before serving and it should taste as good as fresh from the oven. Fresh bread crumbs are so good. I always use to eat the bread in my breakfast so it is very nice suggestion for me and my family. I will keep it my mind. it is always delicious eat bread every morning meal. it is nice idea to freezing them. Thanks for making the recipe so easy and comprehensive. Dude This homemade bread recipe is bomb and my whole family loves it. thank you for posting and sharing it. hi when i look at the bread, it looks quite yummy and soft... keep up the good work and hope to see more of your recipes...bye bye!!! I think this is one of the best recipe for homemade bread. So easy to make and the result was good. I've already baked it 4 or 5 times and it never turned me down. Tks for sharing such a good thing. Guess more practice will makes it perfect! PS: I've yet to write up the blog on my result, but I will linked it here when I'm done..
May i know where to buy Gold Medal Flour in Singapore? Hi Rainie, you can try cold storage. I used to get it from the outlet at vivo city. You may also find it at certain fairprice outlets like fairprice xtra or finest.